During the mid-’90s and early 2000s, blobitecture was all the rage. But it didn’t take very long for the trend to fall out of favor—because at the end of the day you can’t really build a city full of blobby buildings. 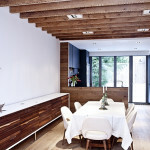 But it looks like the movement just might be seeing a second life within residential design. 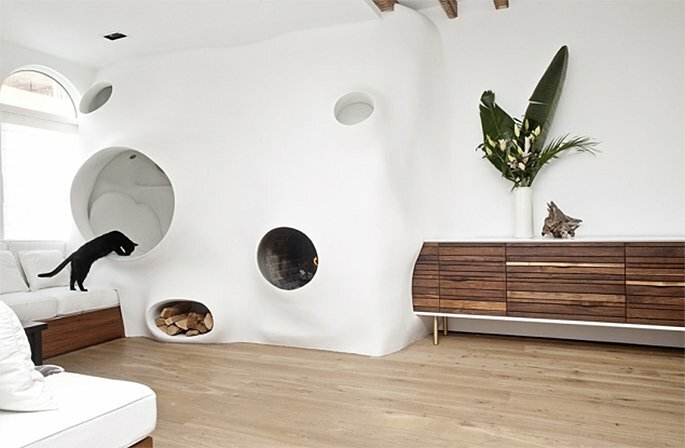 In this 2014 renovation by RAAD Studio, the architects transformed the innards of a historic brownstone on the border of Gowanus and Carroll Gardens into an ultra-modern space with clean lines, sleek surfaces, and most notably, an amoeba-like sculpture growing out of the living room wall. The home is a three-story, 2,960-square-foot construction completely gut renovated and given a modern format with two bedrooms and garden. The owner, Clarina Bezzola, who also happens to be RAAD’s co-designer on the project, an opera singer, performance artist and sculptor, was interested in bringing her penchant for contrasting ideas into the core of the home. 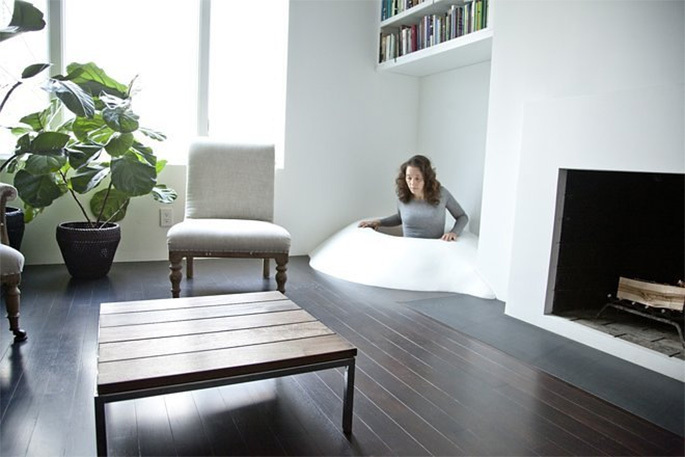 The sculpture is her own creation and draws inspiration from ancient adobe huts and Gaudí to channel the feeling of both “refuge and chaos.” Though unconventional in form, the blob does provide plenty of function with a fireplace, storage, and a cozy grown-up spot hidden within its pores. The sculpture also extends to the second story, transforming the piece into a central artery that ties the two the floors together. On the second floor you’ll also find Bezzola’s workspace, which features a movable chalkboard wall for spurts of creativity, and a seamless open plan. The floor is so seamless, in fact, that there’s an open ledge with the stairway just a slip away. Though this feature makes it easy for the artist to move her works out of the studio, it’s also probably safe to say that there are no kids to be found in this pristine home. If you want to see more of this unique brownstone up close, you can check it out by joining Dwell’s Brooklyn Home Tour 2015 this Saturday. The event will take you through five private pads across the borough that would otherwise be off limits. Tickets can be purchased here.